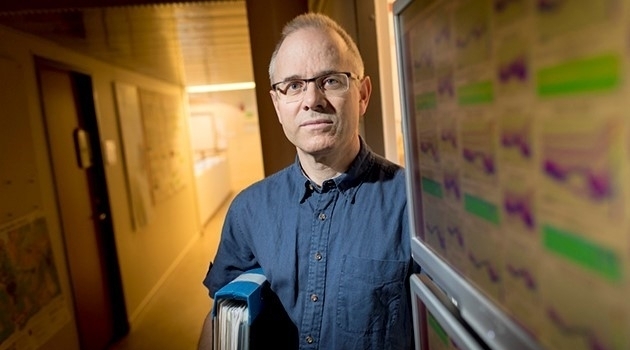 Björn Lund is a senior lecturer at the Department of Earth Sciences and works as part of the Swedish National Seismic Network (SNSN). Hello to Björn Lund, seismologist, who tests sensors for the monitoring of the deep geological repository for spent nuclear fuel in Forsmark. You work as part of the Swedish National Seismic Network (SNSN), which is run by the Department of Earth Sciences and collaborates with the Swedish Nuclear Fuel and Waste Management Company (SKB). What is your project about? “SKB is very interested in knowing where earthquakes occur in Sweden, how they behave and what causes them. They will be responsible for monitoring the deep geological repository of spent nuclear fuel, and so of course they want to be sure that if an earthquake were to occur, they would have good information about it." What does this network of sensors look like? 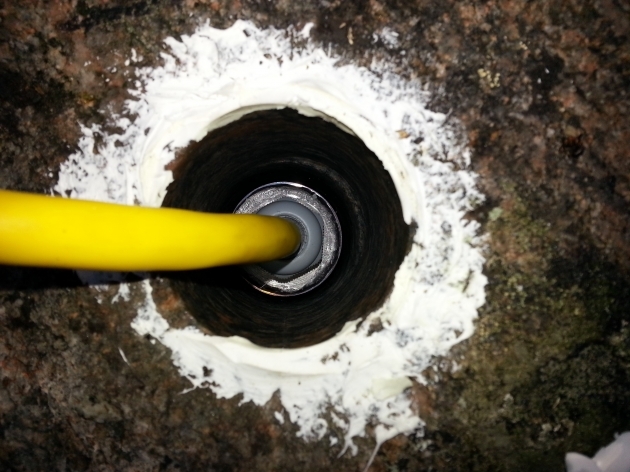 “Borehole sensors looks like steel cylinders of between 5 and 7 cm in diameter and can be up to one metre long. 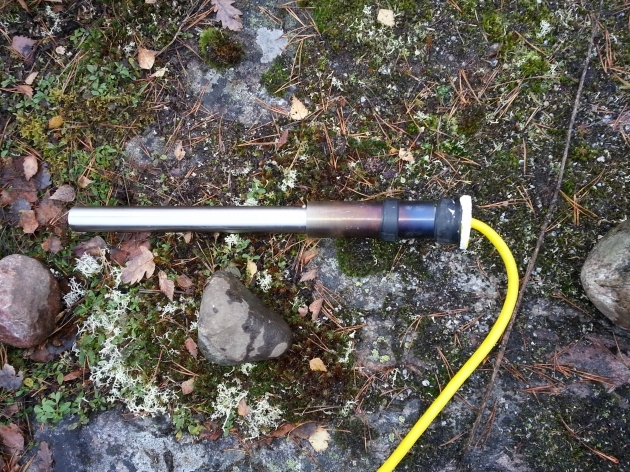 You cement them into boreholes in the rock, where the sensors then detect and measure movements or tremors in the rock mass. Then you have equipment on the surface that records the data and transmits it to a data centre where you analyse the data and see if anything has happened." What are the challenges in this project? “What is difficult from my point of view as a seismologist is that there are three large nuclear power plants right next to where the repository is going to be located, which means there will be a lot of noise in the rock. This is due to rotating turbines and generators and other equipment that produces vibrations that propagate down through the rock. And then there are high-voltage power lines from the power plants, which mean that we’ll register 50 Hertz of noise in our sensors. So it’s a big challenge to try to eliminate that noise and identify these very small movements in the rock mass, if any." Sensor in a shallow hole in a rock. How likely is it that there could be movement or even an earthquake in this area around Forsmark? “We know that historically there are very few natural earthquakes in northern Uppland. But experience from Swedish underground mines in Kiruna, or closer even, those in Dannemora, show that you can get fracture movements when you extract large quantities of rock from deep underground. Because the stresses increase the deeper down you go, the risk of movements occurring also increases. In many of the mines, they have had major problems from induced earthquakes, that is, earthquakes that we humans have contributed to." When do you see that the sensor system can be activated? “Our objective is that the system will be built and operational one year before construction starts on the repository.. Because that way we can measure any differences at the site compared with when the project started. But the schedule keeps getting pushed back because SKB isn’t getting the go-ahead to start construction." “And then right now, there is very rapid development occurring in seismic monitoring instrumentation because of the oil and gas industry and shale gas extraction which is based on fracturing the rock. So we’ve said that there is no need to hurry because otherwise the instruments will have time to get too old. What we build within the next few years will last hopefully for 20–25 years. When we have a date for the start of construction, we will make sure that we are ready in time before it." The deep geological repository for spent nuclear fuel will be located just east of the nuclear power plants in Forsmark in the municipality of Östhammar in Uppland. The spent nuclear fuel will be stored in a system of tunnels and sealed in copper canisters surrounded by bentonite clay at a depth of roughly 500 metres in the bedrock. In March 2011, the Swedish Nuclear Fuel and Waste Management Company (SKB) submitted its application for authorisation to build the repository in Forsmark. In January 2018, the Swedish Radiation Safety Authority approved SKB’s application, while the Land and the Environmental Court determined that the application needed supplementation. The matter is now before the Swedish Government.